NOT even a blank price tag could tempt local graduating students to peruse the hundreds of dresses, suits and accessories on offer at Lowood. Only 10 students attended Saturday's event, which was stocked to cater for hundreds in need of dresses, suits, shoes and accessories to attend school formals. 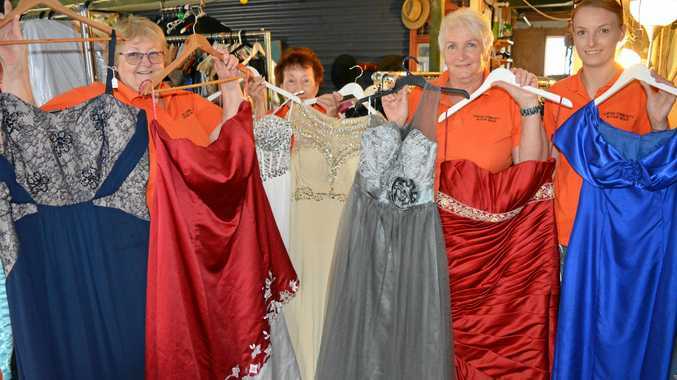 Lowood Community Action Group president Sue Fraser said while the turnout was disappointing she urged students to take advantage of the free formal wear. "If they missed out we still want them to make the most of the dresses and we'd like to see them be used this year,” Mrs Fraser said. Mrs Fraser said the group wanted to make formal season easier for the families of Year 12 students. "We realise it's a struggle this time of year especially if you've got other children in primary school,” Mrs Fraser said. "We just want to make their day awesome and that's what we are doing it for. With a room full of left over formal wear, the group urged local graduating students to get in contact via their Facebook page Lowood Community Action Group Inc.